In not only the last several PSGs we encounter one element – difference. Of course everyone of us is different and thinks in different ways. This can mostly be seen on spots with many signs like: Shouldn’t here be PBS? Shouldn’t here be presignals? Shouldn’t here be <whatever>? The solution often differs, but for example in case of presignals x PBS it often influences at least positioning, often PBS things are a tile shorter than presignals. I am talking about the fact that quite often people ask or just straight modify other’s work without thinking about it and not trying to get the idea that is behind it and why it is built as it is. Sure, we are cooperators and we should talk about things but we don’t have to talk about everything a million times. The result of this article is NOT that I would like to unify our minds to make sheep of us, neither to start making some conventions. No. The thing why I write this is that I want to ask you what would you say if I started blogging some kind of occasional revue where would be noted some interesting things built around our servers, with some notes from authors and some shown possibilities with clarifications and FAQ. That way people could learn faster, and of course it would prevent some errors and needless questions. 😉 What is your opinion? This is the first part of this series. There also will be notes in italics, which are related to the article above. In the latest several PSGs we had the possibility to see V453000’s pickup station with conditional overflow. In this Advanced Building Revue part we will take a look into that. Here we can see the most basic form of this design. It is TL3, 10 platforms per line. Let’s get to building. The most important thing is – as almost always – signaling. The train just passes by around the twoway signals if they are red (if a train is already waiting there). This way they try each of these and only in case there is no one green, it will be sent to the overflow. The penalty and PF trap are in some cases optional as the depot is a penalty itself and trains *should* find the path to the station even that way. Both the penalty and the PF trap are highly recommended to be built though, making 100% sure it will work properly. Also an essential thing is using a timer at the depot join. 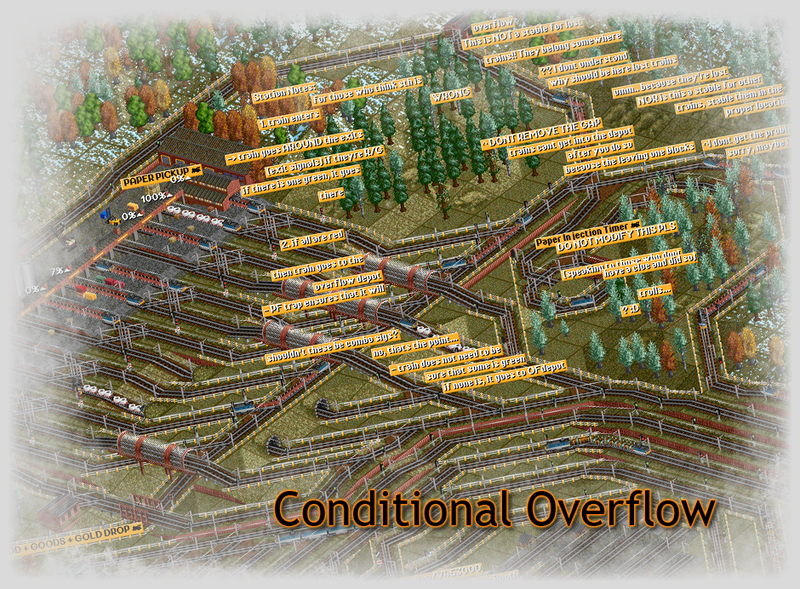 This makes the train regulation more powerful, because trains that overflow can not get that easily back to the network, so if there is more than needed trains, they are quickly put into the overflow depot but then the overflow “tries” slowly how many can be sent back to the network. Why that many platforms? It isn’t absolutely needed but we want to make the station able to work as a completely ordinary station without overflow unless the overflow is needed. Which is basically the point of being conditional. Also don’t forget about appropriate waiting spaces behind the twoway signals! They can be longer but definitely not shorter than 1x TL. The first very vital modification is to reduce number of platforms – mainly in case there is not enough space. 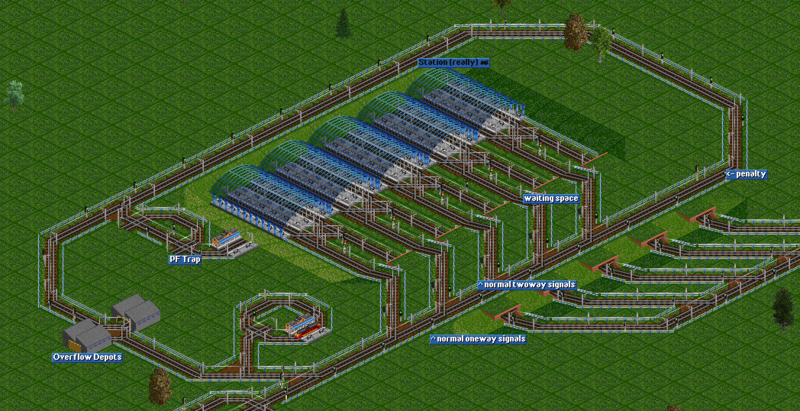 It truly is possible to reduce the number of stations. (don’t ask how exactly as it depends on situation – trains, wagons) One is sure: if we reduce number of platforms, we stress the overflow more. This can result in a slow/jam in the overflow if stressed too much! Another very important and often used modification is that this station can be made in both ro-ro and terminus variants. The ro-ro just bridges the overflow track, merges and just goes away wherever needed. A: The delivery of raw materials fluctuates, trains come at least a bit in waves, the production of the secondary changes. In order to regulate the amount of trains that pickup the products is very nice to use the overflow because it prevents any jams that could even cause some ML congestions. A: Because we want the trains to just pass around the normal signals, therefore we do not need the signals to be connected to those in from of them and interact with each other. It would actually waste most of the mechanism. A: The timer is not needed if the priority of the depot join is long enough but it is a very nice tool how to make trains stay in the overflow longer when they happen to overflow, so they stack in the depot if there is just too much of them. The settings of the actual delay of the timer has to be adjusted with situation. Q: Why the PF trap? A: To ensure that the trains would not stay waiting in front of one of the twoway signals, meaning that it can not find a path through the overflow. PF trap is making sure it works. A penalty is essential to be used in that path to make sure trains try to go into the real station first before they consider going to the overflow. This station is a very effective overflow-styled design and I really like it used for pickup stations. In my opinion it is best for basically any TL, if there is enough space but note that lower TLs have less trouble with the slow at depots which can either require doubling of depot with higher TLs or it could mean that it is better used with lower TL. All in all pretty solid thing.